Mimosa Pudica – The Most Powerful Herb for Parasites? Intestinal parasites are real and they can do major damage in the human body. I often find that individuals I work with who are struggling to get well have a lingering gut infection involving some type of parasite. Parasites are tricky to eradicate from the body as they have a long reproduction cycle and clever protection mechanisms. 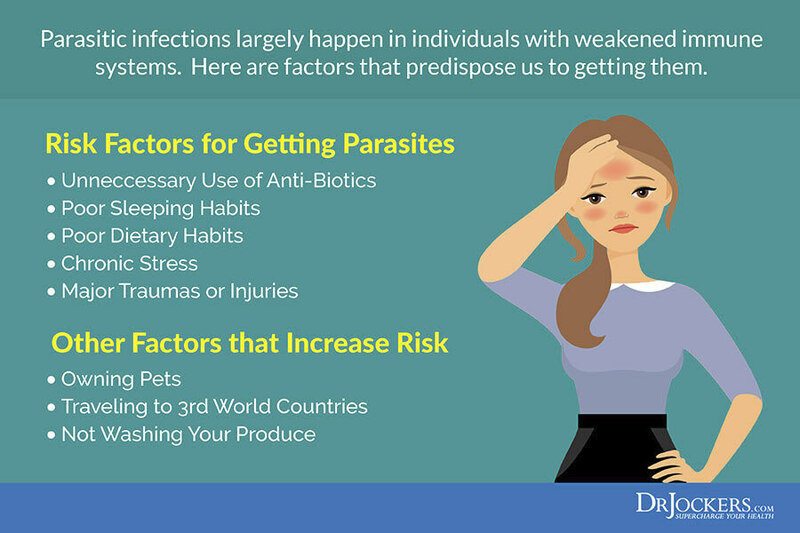 When parasites linger for long enough they cause a number of health complications. Luckily, a powerful herb (and its seeds) called Mimosa Pudica has a remarkable ability to eradicate these worms. You will soon understand my interest in Mimosa Pudica, and also why you and your loved ones should consider adding this little powerhouse of protection to your wellness protocol, targeting the very root of all diseases – a toxic, parasite-infected gut. These organisms are masters of subterfuge, sabotaging our health while hiding undetected. The symptoms of parasite infestation mimic our most common ailments and often, a lack of detection can lead to unneeded medical treatment. Oftentimes prescribed treatments are aimed at non-related conditions and end up leaving the parasites intact and able to dig in deeper. This “sensitive” plant, also called touch-me-not or shy plant, is a creeping, flowering bush-type herb of the pea/legume family. Originally native to South, Central and North America – it is now also a pantropical weed found in Asian countries including Bangladesh, Thailand, India, Nepal, Indonesia, Malaysia, Philippines, Vietnam, Cambodia, Laos, Japan, Taiwan, Sri Lanka and Guam (1). This unusual plant is often grown for its curiosity value: the gentle, small leaves fold inward and droop when touched or shaken, defending themselves from harm, and re-open a few minutes later. Such rapid plant movement is seen in several plants and occurs quickly – usually under one second. The Venus Flytrap is a well-known example of rapid plant movement (2). Mimosa pudica, in particular, closes in darkness and reopens in the light. There are theories about how Mimosa pudica “learns” its behavior since it, like all plants, lacks a brain and nervous system. However, neither hypothesis has gained scientific acceptance; and more research is needed to determine the cause of this interesting learning capability. 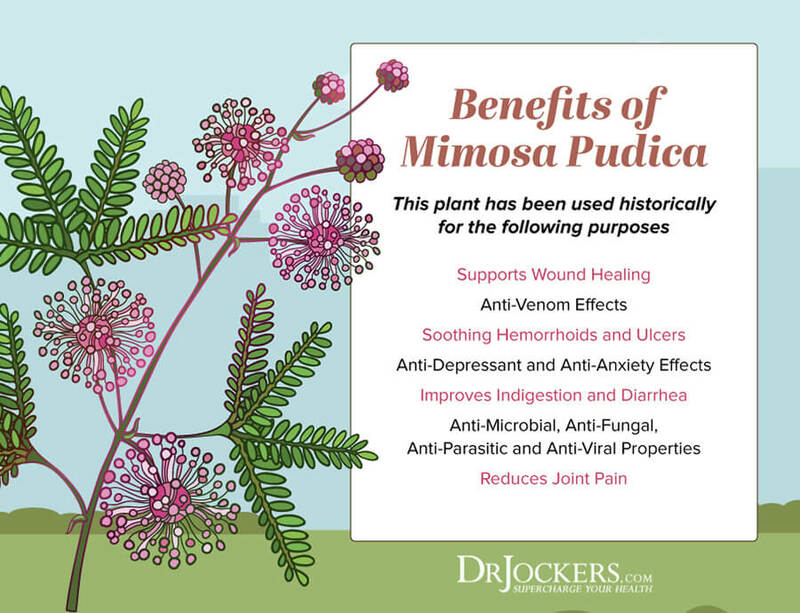 The list of health challenges that have historically benefited from Mimosa pudica is interesting and varied. Indian Ayuverdic medicine, a holistic system of health over 3,000 years old, prescribes Mimosa for a variety of health remedies including dysentery, leprosy, jaundice, asthma, uterine problems, blood diseases, fatigue and more (3). Anti-venom: Water extracts of the roots of Mimosa pudica have shown to have significant anti-venom activity, most notably against the lethal venom of the monocled cobra. It appears to inhibit the myotoxicity and enzyme activity of cobra venom (4). While all parts of the plant are beneficial for a variety of health issues, for this article we are focusing on the seeds. Mimosa pudica seeds consist of a very gooey, sticky fat-soluble material that adheres to everything and helps to support the entire intestinal tract. Phytochemical screening of the “touch-me-not” plant leaf extract showed the presence of flavonoids, glycosides, terpenoids, alkaloids, coumarins, saponins, tannins, phenols and quinines. The root extract showed the presence of fatty acids, glycosides, essential oils, tannins, amino acids, alkaloids, phytosterol, and flavonoids. Some of the important phytochemical compounds isolated from the Mimosa pudica plant are mimosine, jasmonic acid, betulinic acid, stigmasterol, Beta-sitosterol, 2-hyrdoxymethyl-chroman-4-one, dimethyl ammonium salt and mimopudine (5). It possesses antibacterial, antivenom, antifertility, anticonvulsant, antidepressant, aphrodisiac, and various other pharmacological activities. The herb has been used traditionally for ages, in the treatment of urogenital disorders, piles, dysentery, sinus, and also applied on wounds (6). I wrote above that our interest in Mimosa pudica was primarily in its effectiveness as a potent natural anti-parasite treatment. There are several proven, herbal and holistic remedies for parasite infestation and overall gut health. Mimosa pudica seeds, in particular, seem to stand-out in this regard. Intestinal parasites are abnormal and unwanted inhabitants of the gastrointestinal tract that have proven to cause an alarming array of health problems, some of them very serious, to their host. Parasites devour nutrients from the foods we eat, contributing to chronic malnourishment. They can also eat holes in the intestinal wall, leading to leaky gut which introduces an array of serious health challenges. 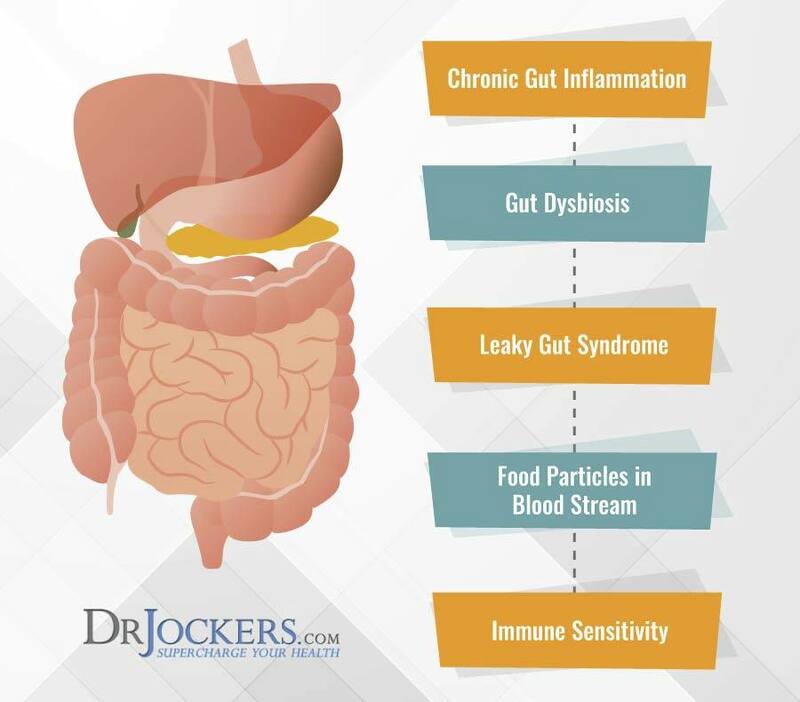 One of the major complications with leaky gut is autoimmunity and conditions such as rheumatoid arthritis, Hashimoto’s thyroiditis, and inflammatory skin conditions. Humans can play host to more than a hundred different types of parasites. If you have been making all of the right choices to get healthy and you seem to be dealing with chronic digestive issues or just can’t figure out why you feel unwell, there is the potential for parasite infection. Running a stool analysis like a GI MAP is a quick and powerful way to determine if you are dealing with a parasite. Parasites can range from microscopic amoeba to 10-foot-long tapeworms. These parasites and their eggs can enter the circulation and travel to various organs such as the liver where they can contribute to abscesses and cirrhosis (7, 8). They can also migrate to the lungs causing pneumonia; and into the joints, brain, muscles, esophagus, and skin where they cause elevated inflammation (9). 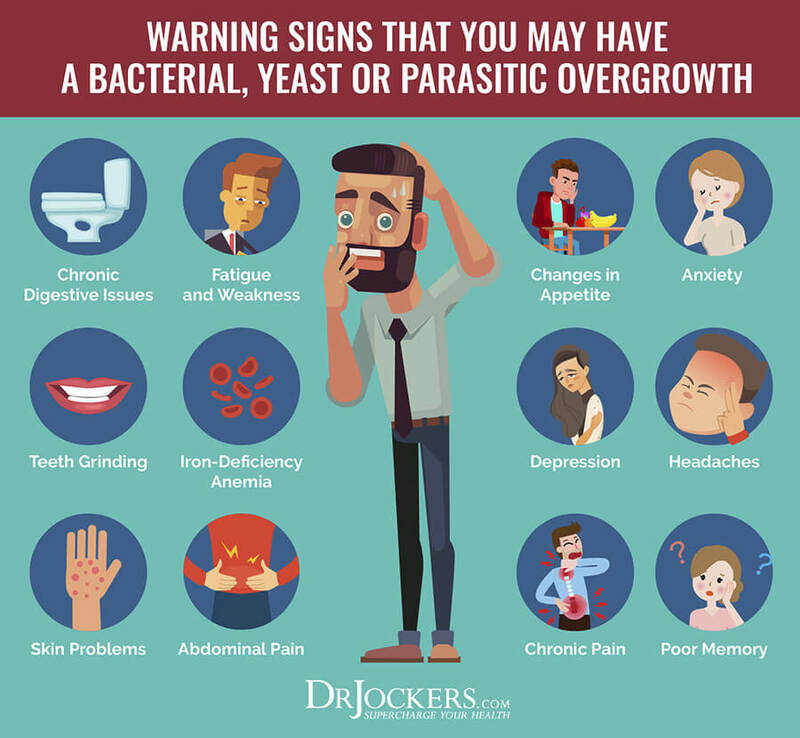 Chronic parasitic infections are linked with intestinal permeability and leaky gut syndrome, irritable bowel syndrome, irregular bowel movements, malabsorption, gastritis, acid reflux, skin disorders, joint pain, seasonal and food allergies and decreased immunity (10). Using something like mimosa pudica can help to bind and pull out parasites before these issues take place or to help releive them. How Do We Get Parasites? Parasites are everywhere. Typically, they are associated with third-world countries, but those of us who live in the United States are not immune. We get them from contaminated food and water, improperly cooked meat, and unclean fruits and vegetables. Restaurant salad bars can be breeding grounds for parasites as well. You can even get them by walking barefoot as they are transmitted through the soil. They can also be sexually transmitted or contracted through contaminated blood and feces (11). Tiny parasitic eggs can be transmitted from person to person through improper hygiene practices such as neglecting to wash your hands after using the restroom. These eggs can be on any surface – door handles, tables, money and much more. In most cases, parasites – like other disease-causing organisms such as viruses and bacteria – enter our bodies because of a weakened immune system. Unnecessary use of antibiotics, a poorly established gut flora, poor diet, and chronic stress can all predispose use to infection. If you find yourself subjected to several of these risk factors, then you may consider using mimosa pudica on a regular basis as a defensive measure. There are three main classes of parasites that can cause disease in humans: protozoa, helminths, and ectoparasites. Protozoa are microscopic, one-celled organisms that can be free-living or parasitic in nature. They can reproduce in humans, which contributes to their survival and also permits serious infections to develop from just a single organism. Flatworms (platyhelminths) – these include the trematodes (flukes) and cestodes (tapeworms). Thorny-headed worms (acanthocephalans) – the adult forms reside in the gastrointestinal tract. Roundworms (nematodes) – these worms can live in the gastrointestinal tract, blood, lymphatic system or subcutaneous tissues. Ectoparasites can broadly include blood-sucking arthropods such as mosquitoes. However, this term is generally used to refer to organisms such as ticks, fleas, lice, and mites that attach or burrow into the skin and remain there for relatively long periods of time (e.g., weeks to months). Arthropods cause diseases in their own right, but are even more important as vectors, or transmitters, of many different pathogens that, in turn, result in tremendous mortality from the diseases they cause. Case in point – malaria, transmitted by mosquitos – causes massive loss of life worldwide (12). Lest we think that ignoring the diagnosis and treatment of parasites is of no great consequence, consider that worms in humans have been clinically related to serious heart diseases as well as to cancer, particularly bladder cancer. Chagas’ disease is one infection in particular caused by a protozoan parasite called Trypanosoma cruzi. Due to increased travel, parasitic infestation formerly seen primarily in developing tropical countries is now diagnosed worldwide. Some parasites may directly or indirectly affect the heart, with infections manifested as myocarditis, pericarditis, pancarditis, or pulmonary hypertension. As a consequence, medical clinicians now routinely consider testing for parasites in the diagnosis of myocardial and pericardial diseases anywhere around the world (13). The evidence is building to support the use of Mimosa pudica to destroy parasites. This evidence is reaffirmed clinically, as those who use it (even without previous symptoms of parasite infection) begin to see worms in their stool. CellCore Biosciences™ developed PARA 1 as a tool for immune and GI system support against parasites. It is especially helpful for reducing the levels of helminths and nematodes, the larger sized worms. As described earlier in this article, the sticky substance extracted from Mimosa pudica seeds is a powerful agent for extracting parasites and pathogens in the intestinal tract. There are no side effects and no adverse reactions have taken place with dosages as high as 20 capsules daily. Our recommended dosage is 2 caps – 2x daily. For sensitive individuals, start with 1 cap daily for a week to let the body adjust; slowly add 1 cap per week until you reach the desired dosage. As any parasites slowly die off and begin exiting the body, it is possible to feel a little under the weather, simply as a part of the detoxification, healing process. This is normal and to be expected. Using something like BioToxin Binder or Activated Charcoal can help bind and reduce any symptoms associated with a die-off. Is all Mimosa pudica fat soluble? No. The mimosa pudica plant itself is not fat soluble. The mimosa pudica seed is fat soluble. CellCore Biosciences™ is the exclusive distributor of mimosa pudica seed. Why is Para 1: Immune & Digestive Support fat soluble? The mimosa pudica seed is fat soluble. CellCore Biosciences is the exclusive distributor of mimosa pudica seed. All other companies sell the plant portion, not the seed. Yes, Mimosa Pudica is USDA Organic. Certified Organic by: Vedic Organic Certification Agency. Take 2 capsules twice daily on an empty stomach or as otherwise directed by a healthcare professional. What can I take with Mimosa Pudica? Mimosa Pudica is best taken away from food, carbon and diatomaceous earth. Mimosa Pudica can be taken with other supplements and herbs. Is what I see in my stool the mimosa herb? No. Not everyone sees changes in the presentation of their stools. Is it allergen free, gluten free, etc? Mimosa Pudica contains No fillers, No additives, No excipients, is Gluten Free, GMO-free, Organic, corn free, soy free and nut free. Is it safe for kids? Please consult a healthcare professional for use with children. Is it safe for animals? Please consult a healthcare professional for use with animals. -Is mimosa pudica seed safe for a woman of childbearing age, who is hoping to someday (like 6 months from now or 1 year from now) to become pregnant? Are the anti-fertility effects permanent? Or is it just while taking the seeds? -If mimosa pudica seed is just definitely not recommended for someone who is hoping to ever be pregnant someday, then what is a safe natural effective product/herb that I could take to eliminate parasites, without the antifertility effects? They are not permanent effects, but I wouldn’t take this during the process of trying to get pregnant. Always best to eliminate parasites before hand and then she will be much more fertile. I have been taking four pills a day of para 1 for two and a half months. I noticed within three weeks of starting that I had very noticeable puffiness / swelling in my face/neck and bloated stomach. Some shortness of breath. Eventually I cut out pumpkin seeds and nuts which seemed to lessen the puffiness and bloating slightly. My shortness of breath is better now. Is it possible as I am eliminating the parasites that I have more food allergies or reactions? For the past 3 weeks I have been following the Candida diet 90% of the time. My question is should I up my dose or stop taking it to see if the puffiness goes away completely. Thank you. Yes this can happen. I would recommend increasing to 3 caps – 2x daily now. Are there any peer reviewed studies of your claims? Yes take a look at the sources for the article. Be Blessed! I have had skin itch in my armpits, nose and body for years now. I thought it was anxiety. I also have grinding teeth so bad I have started to message my jaw. Would these be symptoms of parasites? I would like to get my stool tested and I was wondering how much a test like that costs? I live in Canada so I have to take into consideration the exchange currency. And also how much monthly it would cost for me to start the Mimosa Pudica. Thank you. Is it really necessary to have the stool testing done? I would like to start on the Para1. I have autoimmune. Terrible rash episodes on my chest neck, feels like somethings crawling under my skin, along with many other symptoms that you mentioned in your feed. Im thinking its obvious that I have parasites. Ive noticed that since starting keto and fasting, Im doing better but I want to rid myself of these. Thank you so much for such valuable information. Hey Diane, sorry to hear this!! It isn’t necessary to get the stool testing done but it will help you identify what is going on and using the stool test periodically can help measure results. Thank you for your reply. I am starting to use the Para1. Would it be advisable to use Coconut charcoal to help with die off symptoms? If so, when should it be taken? Yes that can help! You need to take charcoal between meals and also Mimosa Pudica between meals. First thing in the AM and before bed are good times for Mimosa Pudica and then between meals for charcoal. I am 3 weeks in to the Para1 cleanse and taking 4 caps 2x a day at this point. Have not noticed any parasites. Do I keep increasing each week til something shows? Do you need to “see” something? I am going on vacation in 11 days, I was hoping to be done with the cleanse. No you don’t have to see anything. You can continue with that dosage. i recently did gi map w/ drs data and no parasites were sited but tested positive for Klebsiella pneumoniae (3+) and dysbiosis. i have worked hard w/ restrictive diets and probiotics for a long tm but don’t feel like i’m getting anywhere. extreme bloating and sluggish bowels. Would mumosa pudica be an effective treatment for kleb and dysbiosis? Plus i was wondering if the gi map is foolproof in testing for parasites? Yes I think Mimosa Pudica would be extremely helpful for you to do. No lab test is perfect, but the GI MAP is the best I know for looking for parasites! I have been taking probiotics. Should I stop doing that while taking the Para1 ? It is imperative that I use phase 1 or another binder or can I just use the Mimosa Pudica capsules. Hi Dr.Jockers. Is it the whole seeds in the Mimosa Pudica Para 1 capsules or the seed powder? How can that still be as effective as using the whole plant? I am researching this plant because I’m tired of jumping into something to find out later it wasn’t effective for some reason or another. I looked it up in a few places and the reading on it sounds great but Wiki info has me wondering. If you are only using the seed in your product then that is the mucilage which is the sticky stuff made up of acid and sugar and are the building blocks of the plant. Mimosa pudica’s seeds produce mucilage made up of D-glucuronic acid and D-xylose. The extracts of Mimosa pudica immobilize the filariform larvae of Strongyloides stercoralis in less than one hour. I want the extracts! Right, look at what is says here, in less than one hour those larvae start dying. What it’s saying is that , “Knowledge of the phytochemical constituents present in M.pudica leaf will be very useful for the maximum exploitation of this plant in medicine. It has been reported that phytochemicals present in plants are the vital sources of antiviral, anti tumor and antimicrobial agents, so they are used as constituents in allopathic medicine  and also in other systems of medicine.” That’s only a part of it but it goes on to reveal that the plant leaves are quite effective in killing the worms. Please understand that I am only seeking knowledge to find the right product before I spend 6 months on this or any road, I want it to be the right one. I found all your information very helpful and informative and am in no way trying to discredit your product. I really hope you will respond with some information on the seed and why it is used. I don’t see anything supporting it. Thanks for sharing! Yes the whole plant is fantastic. We have seen very good results with the Para 1. Hi Dr. Jockers. I took a bottle of mimosa pudica for a month in November, but after a hiatus re-commenced. Fighting Lyme’s with several co-infections (heavy metals- you know the drill) and using this as part of my protocol. I’m using 3 capsules 2x/day for 2 wks now, but still feel the parasites(worms I’m guessing- and feels like a long one). I’ve heard your mother needed 5 caps 2x/day. Should I wait another week or increase to 4, then 5? I don’t herx, so I’m assuming it’s okay? Yes, as long as you are feeling fine, you can add one more cap each week. Keep us updated! Me and my 10 year old daughter have been diagnosed with Dientamoeba Fragilis almost two years ago. We have taken three rounds of antibiotics but always test positive afterwards. We are now looking to start Humatin, but thinking about buying mimosa pudica too. What is your experience with it on DF ? So sorry to hear this! Yes, Mimosa Pudica would be excellent for DF. I would recommend using this to clear it out! Just enjoyed the Fasting Transformation Summit – thanks for all that! I live in India and can only get the whole seed of Mimosa Pudica. I can grind it into a powder at home but is it safe to take stirred into water or a smoothie? I saw Jay Davidson’s video where mixing the loose powder in liquid made it very gelatinous. Would it be okay to take it like that or must it be in a capsule? Hello Clare, I am glad you enjoyed the summit and so good to have you enjoying the info from India! What a beautiful country with much history about fasting as well! Yes, it is fine to take it this way but you will want to drink it quickly. After watching all the guests on your fasting summit we were drawn to the interview with Dr Jay. We have been doing a 16-8 fasting for 3 weeks. We don’t have any illnesses to speak of but do feel we would benefit from doing a parasite cleans . How long would you suggest we take Mimosa Pudica for? Yes I would recommend doing 6 weeks on the Mimosa Pudica. Begin with 2 caps in the AM upon rising and 2 caps before bed. If you feel fine with that, bump it up to 4 caps in the AM upon rising and 4 caps before bed. Blessings! Thank you my friend. May you continue to inspire those who are looking for direction. Is it enough to buy one box if I want to do a 6-week cure? I cannot see how many tablets are in the box. No you will definitely need 2 of them. 120 caps per bottle. I would recommend 2 caps – 2x daily. The essential oils should be totally fine! Blessings! The challenge that was given out with Mimosa Pudica Seed – Take 1 cap every half hour on a day you are fasting. Will this cleanse everything out or does it need to be repeated? Will you have more serious reactions doing it this way? Thanks for your help. I really enjoyed The Fasting Summit. This can be very helpful! Most people tolerate it very well without any side effects! Can Mimosa pudica seeds be takin in conjunction with metformin (500gr x 3 for PCOS) and tranaxemic acid? You will need to discuss this with your prescribing physician. 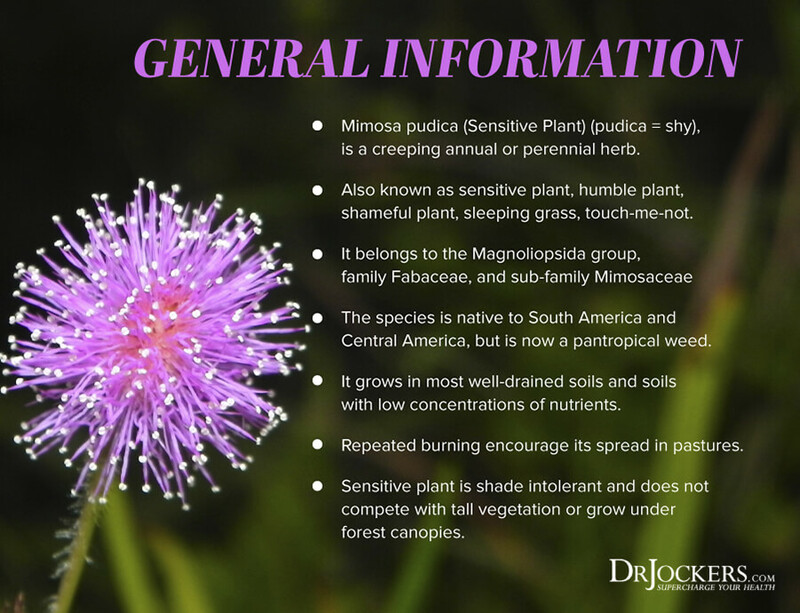 Dear Dr Jockers, thanks for the info on mimosa pudica. I believe I have microscopic parasites but the article said this is best for worms. What would you recommend for what I have, please? Thanks. Yes it can help with both! Blessings! I have been diagnosed with FSGN – focal segmental glomeruli nephritis and I have been prescribed Telmisartan, Spironolactone and Crestor. I also take Eltroxin for my thyroid. I have also been struggling with pain in both of my feet and the doctors have not been able to find anything wrong with them. I would like to try the mimosa pudia but not sure if it will affect the other meds that I am on. It should be fine…but I would be sure to discuss this with your doctor. I plan to take mimosa pudica for parasites. Does it also rid the body of yeast (candida) and toxins at the same time? What is the best most effective detox to take along with the mp for overall drainage and detox of the die off from the colon, liver, bile duct, kidney, lymphatic and glymphatic systems? It seems overwhelming to have to take a separate detox for each and every one. Thank you for he important work you are doing. I just finished my SIBO herbal treatment of berberine complex and still have gas and bloating. I suspect I have parasites. I do entric coated peppermint oil 30 mins before breakast and dinner and 1 500mg ginger capsule after breakfast and dinner. When should I add the Mimosa Pudica and activated charcoal timing wise. Will the ginger and peppermint interfere with Mimosa Pudica? Hi Meera, Taking activated charcoal with meals can reduce gas and bloating, especially if you eat something that you are sensitive or allergic to. It can however bind to some of the nutrients taken with a meal. Para 1 is best taken at night on an empty stomach and away from the other supplements you are taking around meal times. Blessings! Thank you so much doc!!! I can’t wait for my mimosa pudica to arrive tomorrow. Will the Mimosa Pudica interfere with the peppermint oil or ginger ? I’ll start activated charcoal with meals. Hi Meera, These herbs work by reducing inflammation and serving as natural antibacterial agents. Mimosa Pudica cleans the digestive tract by pulling out removing unwanted elements attached to the intestinal walls allowing it to pull and flush out parasites. Feel free to keep using peppermint and ginger oil but make sure you are taking the Para 1 on an empty stomach for effective results. Here is an additional article that may be helpful: https://drjockers.com/7-reasons-to-use-carminative-herbs/. Blessings! Thank you so much. Within a day of para1 I started seeing 1 feet long sticky things in my stool. They don’t break but i don’t see a body inside either. Is this bio-film from my SIBO or some kind of worm? How long should I be on Para1? . I am only taking 1 per day empty stomach in the morning. Thank you for your advice and blessings. I just read your articles on parasites and the para1. Im afraid i have these in my body. Hi Fides, Begin with 2 caps in the AM upon rising and 2 caps before bed. If you feel fine with that, bump it up to 4 caps in the AM upon rising and 4 caps before bed. Blessings! I have been feeling unwell, light headed and fatigued for many months , I have had so many blood and urine tests and MRI s etc but every time I’m told there’s nothing wrong with me! I feel that my life has been taken away from me, I’m 74 and normally extremely active and fit. I have a very healthy diet almost 100% organic. I’ve had to give in and take Citalopram……can I take your mimosa pudica seed supplement whilst taking Citalopram?